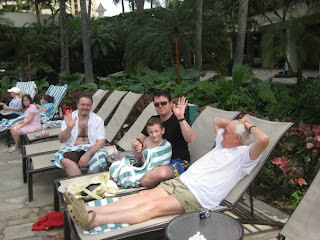 Excellent Vacation Ideas: Andy and Michelle's Wedding at the Hilton Hawaiian Village - Day 3 - Wedding Day! Andy and Michelle's Wedding at the Hilton Hawaiian Village - Day 3 - Wedding Day! Day 3 of our trip to the Hilton Hawaiian Village was Andy and Michelle's wedding day! The girls and the guys decided to eat breakfast separately (the bride really shouldn't see the groom before the wedding!) We had a great girls breakfast and a nice chat. Michelle was a little nervous that morning, but after a text from her groom and a call from back home, she was calm and ready to get married! I had a hair appointment at 11, so of to the Mandara Spa in the Kalia Tower I went. They were great in there. The staff were friendly and listened to what I wanted. I hated my hair - but I figured if everyone told me it looked nice then I would believe them. Afterall I am the worse judge of my own hair - lol - don't worry it didn't look like this in the end! Hannah came in a little after me to have curls put in her hair and a flower for her role as flower girl. Tip: If you are getting married while in a resort - work into your budget a trip to the salon to get ready - it was simple and made the day go easier! Then Michelle's mom and finally Michelle. Since I was done earlier I went to check on the boys who were enjoying their morning by the pool - ahhh isn't it nice to be men and not have all the primping and getting ready to do? Just jump in the shower and it is done! 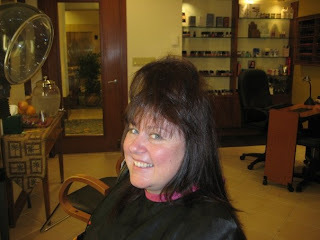 After some sushi with the boys at Hatsuhana I was off to get my stuff and meet Michelle at the hair salon. Sure enough she was ready so we walked back to her room to get her ready. The boys got ready in our room - Kyle got to have a bath in the funky bath and the boys took it easy until it was time to go the the chapel. 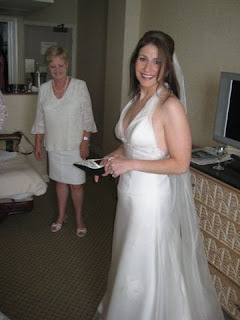 After a small "I hate my hair" breakdown - again remember it is better to let other people decide whether or not your hair looks good - and a glass of champagne - she put her dress on and was the most beautiful bride! So after a lovely gathering of dressed up ladies, off to the chapel we went. Warren and I were constantly in communication to keep the bride and groom apart. It is a large resort - but not that large! We made it to the bride's room in the chapel and I texted Warren to say all was clear. The boys arrived and we were ready to go... or were we? Continue to next wedding post.....what were we missing?